In 1999, with the violinist Marina Marsden, David Miller - piano and Wendy Dixon - soprano formed Grevillea Ensemble, performing in a subscription series at the Crows Nest Performing Arts Centre and making guest appearances in many other venues. Grevillea was formed by these accomplished artists to communicate and share their love of music with their audience. During recitals, the artists talk to the audience about the music they are playing in an informal, intimate atmosphere. At the end of each recital the audience has the opportunity to chat with the musicians over complimentary refreshments. In 2004 Marina left to focus on a chamber group with her sister, and Grevillea created the format that has remained to this day, a duo of voice and piano in collaboration with guest artists. Now in its 21st subscription year, Grevillea has been critically acclaimed, especially for "imaginative programming" (John Carmody - Sun-Herald) and "invariably insightful performances" (Fred Blanks - Ku-ring-gai Observer). Grevillea has given performances at the Australian International Conservatorium of Music, the Liszt Society, in Bowral, Byron Bay and Nowra as well as many of Sydney's Music Clubs. This ongoing relationship is also producing CDs of Australian song cycles and trios written especially for Grevillea Ensemble by composers including Richard Charlton, Martin Wesley-Smith, Stephen Yates, Margery Smith, Trevor Pearce, Nigel Butterley and Hugh Dixon. Grevillea is fiercely committed to Australian repertoire and living composers and have commissioned and performed many new works. In 2000, Grevillea Ensemble received Special Mention in the Group category of the Centre for Australian Cultural Studies National Awards for "An Outstanding Contribution to Australian Culture". In 2002, ABC Classics released a CD recording of songs by the Australian composer, Horace Keats, entitled Echo by the three Grevillea Ensemble artists and Australian baritone, John Pringle. 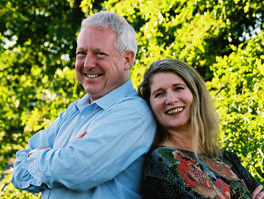 Wendy and David have also co-written three books on Australian art song: Songs from Australia (with Linda Foulsham and Cathy Aggett), Voice of Australia 1 (with Linda foulsham), and Voice of Australia II, all with accompanying CDs of the songs performed by Wendy and David, recorded by Peter Bell and published by Wirripang. Commisions include Stephen Yates "Late Autumn Dove" (soprano/violin/piano), "Three Tobacco Songs" (voice/piano), Richard Charlton "Statues" (voice/piano), Matthew Orlovich "Bird of Paradise" (soprano/violin/piano), "She like the moon rises" (soprano/oboe/piano), Philip Wilcher "Nativity" (voice/violin/piano), Daryl Pratt "Where does the dancer dance" (voice/piano/vibraphone/marimaba), Michael Dixon "Bach Collage" (voice/piano/vibraphone/marimaba), Hugh Dixon arrangements of Binchois and Machaut (vibraphone/voice). In 2006 Martin and Peter Wesley-Smith joined us for an exciting innovative approach to contemporary commentary by wroting topical political satires for each recital. These were very well received by audience members. John Peterson rearranged his cycle "Eternity's Sunrise" in a higher version for Grevillea Ensemble and Andrian Pertout created a special arrangement for Grevillea of his work "Sonus Dulcis"
Grevillea Ensemble has made arrangements for voice, violin and piano (with the kind permission of the composers) of "Love me Sweet" by Carl Vine and "The Stars Turn" by Peter Sculthorpe, for voice, bassoon and piano of "Song of Tailitnama" by Peter Sculthorpe and for voice and bassoon of "Maninya 1" by Ross Edwards.